We have planned four exciting weeks of Vacation Bible School this summer. Lord willing, four sister churches from across the country will come to Lakeshore displaying God’s glory before the children of our storm ravaged community. Almost every family in our area still lives in cramped FEMA issued campers. Providing an opportunity for kids to get out and gather on our church property for God-centered Bible saturated fun hopefully will help alleviate the burden of parents who look for something to occupy their youngsters long summer days. We relish the opportunity to point families to solid hope in Jesus Christ. May 22-26 ~ God Always Wins! God displays His power so that we might see His greatness. Our response to His greatness should be worship. That is what this curriculum is all about – showing the greatness of God that children may come to worship Him. God is presented as the great Victor who triumphs over all enemies, including Satan, death, and sin. One of my heroes in the faith, Tom Ascol, will bring folks from his church, Grace Baptist Church, to Lakeshore this summer. Ascol serves as director of Founders Ministries. They will use the VBS Reachout Adventures Genesis 1: Space Probe curriculum. Time-traveling starships take crew members deep into the book of Genesis where creation unfolds before their very eyes. God’s design for his world becomes clear as costumed eye-witness storytellers bring God’s Word to life. By mission’s end, Astronauts are challenged to be certain they are safe in the “Ark” of eternal salvation, Jesus Christ, and ready to love and worship Him as Lord of the Universe! Pastor Dave Stephenson and Grace Bible Church linked up with Lakeshore immediately after Hurricane Katrina hit. One of their members, Greg London, serves as our full time project coordinator. I can’t thank them enough for their deep partnership. In July they will use the Children Desiring God curriculum, “Things Hidden” for VBS and also host evening meetings for adults. The parables of Jesus contain glorious, life-changing truth. But the beauty and worth of God’s truth is hidden from those who have blind eyes and a divided heart. Using hidden treasure as a metaphor for spiritual truth, this study of kingdom parables exalts God alone as the source of spiritual sight and an undivided heart. The goal of this curriculum is to awaken spiritual interest in children, so that they might seek after the hidden treasure of God and find their satisfaction in Him. Riverside Fellowship’s long term commitment to Lakeshore brings them to minister in our community once again at the end of the summer. We look forward to this exciting week of fun filled in-depth Bible study. Can’t wait to hear about the first week of VBS! Praying for you all there. 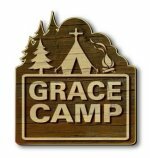 Do you have any suggestion for vbs theme “Around the Camp fire with Jesus?